The author, in the Fleet sewer, clutching breathing apparatus. Continuing our series looking at disasters you've probably never heard of. Ever been down the sewers? We have. You might want to take an oxygen cylinder. Not because the sewers smell foul (they generally don't), but because fatal gasses can rapidly build up. In one tragedy, five men succumbed to poisonous fumes in the sewers beneath Pimlico. First a simple historical note. 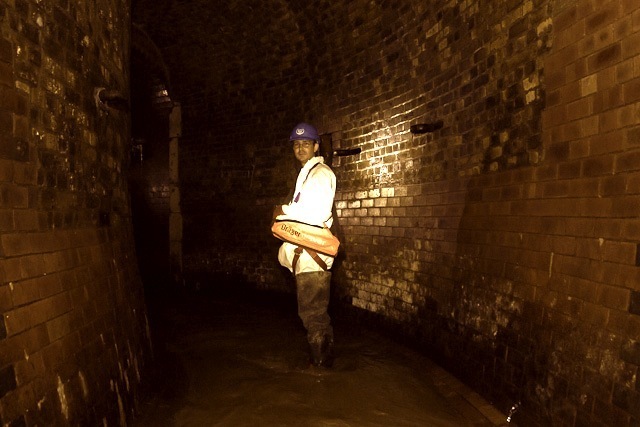 It's often stated that London's sewer system was designed by the engineer Joseph Bazalgette in the 1860s. In truth, London had long been served by numerous sewers. Bazalgette upgraded some of these, and built the vast intercepting sewers to draw the effluent away from the Thames to treatment works in east London. But he didn't build the network from a standing start. Pimlico, for example, enjoyed a newly built sewer system two decades before. The well-to-do streets had been laid-out by Thomas Cubitt from 1825, and the sewer in our story had been laid in 1847. It was early in the morning of Friday 12 October 1849. The police were tipped off that three workers had entered the sewer on Willow Way (now Warwick Way) several hours before, but not returned to the surface. The police arrived, and sent a labourer down to check. He quickly returned, to report that the trio were laying in the water, their condition unknown. For reasons not recorded, rescuers decided to enter the sewer at a different point: an entry on Kenilworth Street (now Cambridge Street) that had been bricked up until such time as the terrace above would be completed. A rescue plan was hatched to reach the men, "some of those present entertaining a hope that with timely succour they might yet be saved". Labourer Richard Sherman, accompanied by surgeon Henry Wells attempted to access the tunnel, only five feet high. The pair were absent for several minutes, to the point where a policeman named John Walsh decided to investigate. He quickly emerged with the body of surgeon Wells, "when every trace of life was extinct". Back went Walsh, undeterred, and dragged out the spluttering labourer Richard Sherman, who later recovered. But the gallant Walsh returned for a third foray, to assess the state of the original three labourers. This time he did not emerge, at least not until he was "in his turn dragged out a corpse". The police decided that enough was enough and prevented anyone else risking their lives. Instead, workmen were encouraged to dig up the sewer along Kenilworth Road. Two holes were excavated, leading to 'another escape of pestiferous gas', but this time precautions had been taken and nobody was harmed. The bodies of the three labourers — Thomas Gee, Daniel Peart and John Attwood — were finally recovered, and laid-out with that of policeman Walsh at the nearby Clarendon Hotel. The bodies "presented a most extraordinary appearance," according to a reporter for The Age, who witnessed the scene later on. "The faces, necks and upper part of the chest were completely bronzed, and having a glaze on them, particularly the front of the face. The face of policeman Walsh [who had spent less time in the sewer] did not have the same extraordinary appearance, being a little blueish". An officer from the Commissioner of Sewers then did a test, dipping a coin into the sewer. It turned black in just 18 seconds, supposedly from the actions of carbonic acid. Those trapped below had not stood a chance. A later coroner's inquest, conducted at the Clarendon, pointed to a combination of sewer gases such as hydro-sulphate of ammonia and carbonic acid, and possibly mixed with lime deposits. But as witnesses observed, such conditions were found in many sewers. Here, poor ventilation and drainage, exacerbated by the bricked-up sewer end, concentrated the noxious mixture, resulting in a swift end for anyone who entered. One expert witness, the superbly named Dr Lyon Playfair, later investigated the sewer and delivered the following damning description. It was a misnomer to call this piece of work a sewer; it was rather an elongated cesspool, and the three houses in Kenilworth Street must have passed 1 1,380 pounds (5.7 tons) of excrement into it during the two years that it had been in use. That amount of liquid matter in a closed sewer like this would produce a gas in which no animal life whatever could exist for a single moment; and directly the unfortunate men, whose deaths furnished the subject of this inquiry, entered the sewer they were struck dead. The inquest ultimately found that the lack of ventilation and poor maintenance had led to the tragedy. Members of the jury pointed out that the sewer commissioners might have used the nearby Grosvenor Canal to flush the feculent build-up into the Thames, but the coroner deemed this beyond the scope of the enquiry. It should be noted that not everyone agreed with the findings, and debate raged in the press and courts over the nature of the gasses. The later improvements of Bazalgette, and the introduction of ventilating 'stink pipes' later removed many of the dangers of sewer gases, but not completely. The possibility is still taken seriously by Thames Water, who require all who work in the sewers to carry breathing equipment.